You've likely heard of SEO and its use in online marketing. But do you know the best way to utilize it for your recruiting process? In this article we would like to give you an overview of what SEO is and why it is so important for a successful recruiting strategy. SEO is short for search engine optimization. It includes all measures that aim to increase the visibility of websites in search engines. For example, a website appears on Google in a higher position and is found more quickly. The aim is to get the highest possible ranking in the organic search results. SEO strategy is used for multiple reasons in recruiting. For example, making sure that your job advertisements are search engine optimized so that they can also be found on Google. This gives you the opportunity to use Google as a free channel. A search engine is a technology that helps to find something through a search bar function. In recruiting, these are usually jobs or employers. However, Google is not the only search engine that can be used for recruiting. Besides general search engines (like Google, Bing, Yahoo, etc.) 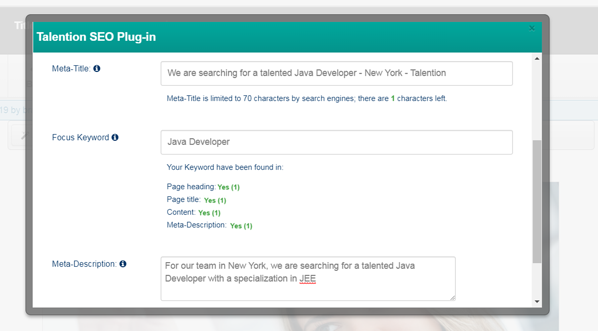 there are also job search engines. Job search engines, such as Indeed or Glassdoor, are special search engines that are limited to job ads. What do you need to keep in mind when optimizing for search engines? First, you should define a keyword. In the case of job advertisements, this should be the correct job title, which is also used by your desired target group. This keyword should not only be contained in the title of the job advertisement, but should also appear several times in the content of your job advertisement. However you should avoid "stuffing" the keyword in the text too many times. In this case the search engines may recognize that the content was written only for SEO and will penalize it. In addition, your job advertisement should contain a meta description in which the keyword is mentioned. The meta description is the short description text that appears in the search engine results. The keyword should also be included in the URL. With the Talention SEO tool you don't have to remember all of these steps. All you need to do is formulate your job ad and define a keyword. The Talention SEO tool will then show you step by step what you need to optimize you ad and get a very good SEO result. You don't have to be a technical expert to create a search engine optimized job ad, just follow the instructions in the SEO tool step by step. Would you like to learn more about SEO? We would be happy to show you best practice SEO examples and how the SEO tool works in the Talention software. Just ask for a free demo here and someone will get in touch with you shortly. Request a demo now.